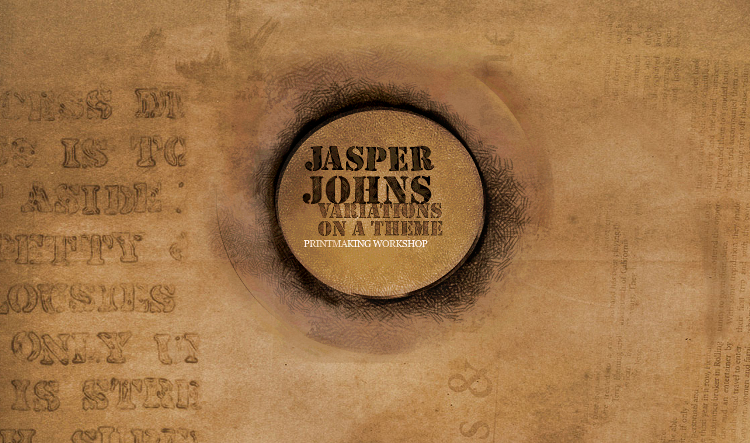 Recent exhibition Jasper Johns: Variations on a Theme focused on Johns’s creative impulses and collaborations with several distinguished print shops. To produce events and content for the exhibition, Phillips staff also engaged in rich, inter-departmental collaborations. Assistant Curator Renée Maurer and Digital Media Manager Michelle Herman teamed up to create the museum’s first ever in-house microsite Jasper Johns: Variations on a Theme Printmaking Workshop. They reflect on the process here. Renée Maurer: From the beginning, I wanted there to be a workshop for visitors to see the tools of printmaking. I also wanted there to be a program where visitors could experience firsthand how to make a print. I worked with Brooke Rosenblatt and Amanda Jiron-Murphy in the education department to bring master printer Scip Barnhart to the museum for a program. We decided Scip’s event would have to be small as it would take place in the workshop adjacent to the exhibition. I was able borrow materials from Scip for the show, and he agreed to lead a type of printmaking class. His enthusiasm for the program and for Johns was so high that he even made a lithographic stone and an etching plate with imagery from the exhibition for the occasion, which he pulled (ahead of time) for attendees. Michelle Herman: A working group that I lead considered ways to feature digital content from the exhibition on the Phillips website. After looking at various examples such as MoMA’s What is a Print?, we devised a plan to shoot Scip’s workshop on video and showcase it in a custom-built microsite. This would allow the workshop to have an impact beyond its small in-person audience. We enlisted A/V Support Specialist Mark Weiner to accomplish this task. Scips’ program was filmed and then edited down to focus on the three printmaking processes: etching, lithography, and silkscreen. Renée recorded voice-over to describe Scip’s actions and added contextual information for the site based on the concepts from the exhibition. Renée Maurer: Everyone did a fantastic job. Mark was great; he had to cut and paste a lot of footage, and then we had to match my narration with the steps that Scip was performing. Michelle offered a wonderful vision. Michelle Herman: I worked on the concept, design, and development of the interactive. Assisted by my summer interns Jordan Albro (designer extraordinaire) and Michelle Shen (HTML guru), I began to think about how the site would look and function. I tasked Jordan and Michelle to research potential model sites that focused on video content. After reviewing several of them, we decided to build the site as a single page that would allow the user to fluidly scroll between each of the three sections. After spending time in the exhibition, I was really captured by Johns’s use of different paper colors and the rough textures he created through some of the print processes. I knew the interactive should mimic this textural quality. I developed the initial design concept and explained my idea to Jordan (who acted as junior designer on the project). He then turned these digital sketches into backgrounds and other components of the site. The result is layered, complex, and just beautiful. While Jordan was refining the design, Michelle (who served as the site developer) began coding. Her HTML skills were incredibly impressive—and fast! My team presented these concepts to Renée, who was very receptive and excited by our ideas. We then pushed forward to create the site. With the addition of a new multimedia section to our recently relaunched website, the Jasper Johns interactive now has a home and can serve as a resource going forward. Renée Maurer: I think the site looks terrific, and we will continue to update it. I would definitely work on an interactive like this again. The only problems we encountered had to do with scheduling. Shooting and reviewing the footage was also more challenging than I expected. Overall it was a great learning experience. I enjoyed working with colleagues in different departments and with technology. Long before he led Thursday’s Jasper Johns-inspired printmaking demonstration, Scip Barnhart brought his master printer credentials to the Phillips. 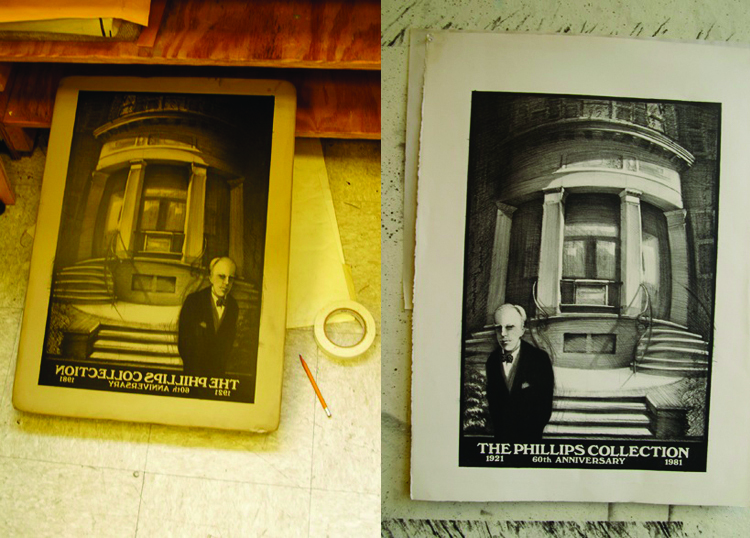 In 1981, Scip presented Marjorie Phillips with this proposal for a 60th anniversary commemorative print–an image of Duncan Phillips posed with furrowed brow before the museum’s original entrance, as if seen through a fishbowl or convex mirror. Though the print was not accepted for the diamond anniversary, Scip held onto it over more than 30 intervening years (it hangs framed on an upstairs wall of his home) and shared it with us as we prepared for a major exhibition focused on innovation in his medium of printmaking. This evening, a sold-out audience will look on as master printer Scip Barnhart demonstrates basic printmaking techniques on view in the exhibition Jasper Johns: Variations on a Theme. Barnhart, who teaches printmaking, art of the book, and drawing at Georgetown University and is director of Union Printmakers Atelier, created a limited edition print for the occasion. 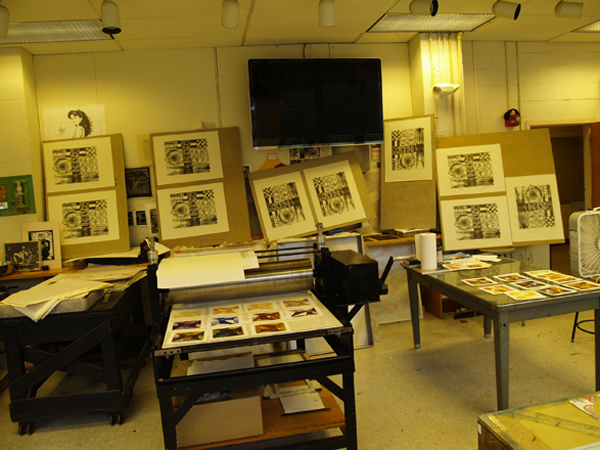 He printed one for each participant and hung them up to dry in his studio last week, then sent us this photo.